The Main Lawn is a large expanse of lawn in the heart of Kirstenbosch. This area of the Garden is particularly popular with picnickers and family groups, enjoyed by children and their parents. Set at the centre of the Main Lawn, beside a majestic old oak tree, is the Main Pond, also known as the lily pond or reflecting pond. Water plants, like Cyperus papyrus (papyrus) and Crinum campanulatum (marsh lily) thrive in the boggy soil at the water’s edge, while Nymphaea nouchali var. caerulea (blue water lilies) and Aponogeton distachyos (Cape pond weed or waterblommetjies) grow in the pond. It is fed via a cobbled stream that channels the natural spring water that bubbles up in the Dell. The stream is a favourite paddling place for children. Visitors to this area are sure to encounter Guinea Fowls, Egyptian Geese and Cape Francolin. 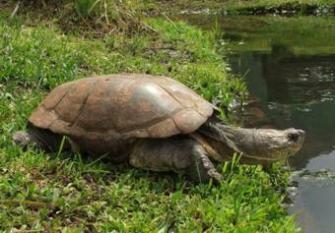 You may even see the Marsh Terrapin if it comes out to sun itself on the edge of the pond. to find out more about the plants.